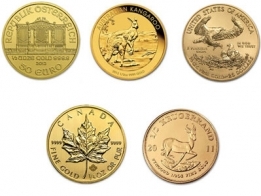 1/4 Oz gold bullion coins -999+ fine investment grade gold bullion coins. The 1/4 Oz gold coin is the lowest premium gold coin that is available for purchase on SuisseGold.ch, and is being offered for clients looking to buy gold coins to invest in. The coin that is supplied to you when you place your order will depend on our current stock availablility. However, all coins supplied are guaranteed to be from recognised government mint worldwide. 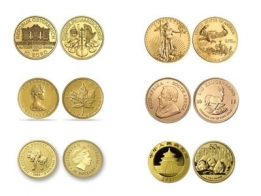 These are examples of the types of gold coins provided - other recognised gold coins may also be provided. These 1/4 oz gold coins are low-margin, low-premium gold coins available for clients who are interested in buying gold coins for investment purposes, and who do not have a preference over the brand supplied. Please contact us if you have 1/4 oz gold coins you would like to sell.